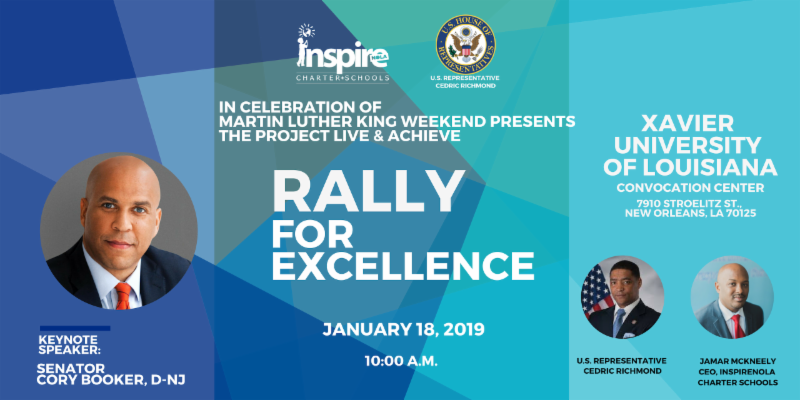 On Friday, Jan. 18, U.S. Sen. Cory Booker, D-New Jersey, will keynote the “Project LIVE & Achieve” Rally for Excellence that 5,000 students from more than 20 local schools across the New Orleans area will attend. Booker is appearing at the invitation of rally hosts InspireNOLA Charter Schools and U.S. Rep. Cedric Richmond, D-New Orleans. The rally is a part of InspireNOLA’s celebration of Martin Luther King weekend that focus on academic excellence and nonviolence, along with an MLK Basketball Classic on Monday, Jan. 21. Project LIVE & Achieve is a comprehensive program bringing schools, community groups and faith organizations together to promote nonviolence, academic success, high expectations and community involvement, with the main goal being to decrease violence impacting New Orleans youth and to strive for higher academic outcomes for students. “Sen. Booker is an amazing role model nationally for our students, and can inspire so many of our youth by sharing his own story and past experiences. This is a truly incredible opportunity for the students and overall community of New Orleans,” said Jamar McKneely, CEO of InspireNOLA Charter Schools. The event will take place Friday at the Xavier University Convocation Center, 7910 Stroelitz St., beginning at 10 a.m. For very limited community tickets or for more information, please email info@inspirenolaschools.org.